Biography of Famous Greek Sculptor, Noted for "The Apollo Belvedere". by the Greek sculptor Leochares. of sculpture from ancient Greece. One of the leading figures in Athenian Hellenistic Greek sculpture of the 4th century BCE. Leochares' main claim to fame was that he worked on the Mausoleum of Halicarnassus with Skopas - one of the greatest sculptors of Classical Antiquity. The Mausoleum was one of the Seven Wonders of the Ancient World. Other 4th century contemporaries of Leochares included, Lysippos (395-305 BCE) and Praxiteles (active 375-335 BCE). 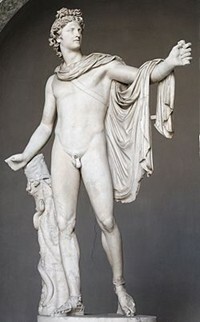 The famous sculpture of Apollo Belvedere (Roman copy, Vatican Museum) is attributed to Leochares. Born in Athens, around 360 BCE, Leochares is mentioned in several ancient sources but remains an elusive figure. It is believed he worked with Skopas, along with two other sculptors, on the friezes at the Mausoleum of Halicarnassus, but it is not possible to verify that any remaining portions stored at the British Museum in London belong to him. In about 338 BCE, King Philip II of Macedonia commissioned him to produce sculptures of the royal family. They included statues of Philip II and his son Alexander (the Great), Amyntas III (father of Philip II), Olympias (wife of Philip II), and Eurydice II (daughter of Amyntas III). The statues were made of ivory and gold, and were placed in the Philippeion, a circular building in the Altis at Olympia, erected by Philip II of Macedon in celebration of his victory at Battle of Chaeronea. On somewhat tenuous evidence, a seated marble figure of the goddess Demeter (the Demeter of Cnidus, British Museum, London) has been attributed to Leochares' hand. It is considered one of the finest Greek sculptures to survive the 4th century BCE. Diana of Versailles (c. 325 BCE), a slightly over life-sized marble sculpture of the Greek Goddess Artemis with a deer, located at the Louvre Museum in Paris, is a Roman copy of a statue originally attributed to him. Diana is represented as a slender but masculine hunter, in the full bloom of life. She looks to the right, perhaps at the deer she is about to kill, and draws an arrow from her quiver. Leochares appears mainly to have focused on stand-alone sculptures and statuettes, receiving many commissions for portraits. He also worked with other artists, such as Lysippos, and together they reportedly make a group bronze at Delphi representing a lion-hunt of Alexander. He also created statues of heroes and Gods, as was standard at the time, including those of Zeus, Apollo and Ares. (See also: Greek architecture.) A statuette in the Vatican, representing Ganymede being carried away by an eagle, although poor executed (it is a copy), corresponds to a bronze casting which the Roman writher Pliny attributed to Leochares. To learn to evaluate Greek Hellenistic sculptors like Leochares, see: How to Appreciate Sculpture. See review of: Venus de Milo. Leochares remains something of a mystery in both his life and works, with opinion divided as to which sculptures can truly be attributed to him. Even so he remains a leading exemplar of the Hellenistic School of Greek sculpture. The lightness and ease with which he and other comparable 4th-century artists applied to their work were said to have influenced the arts of the Baroque period, nearly 2,000 years later.  For more on the evolution of Greek classical sculpture, see: Homepage.